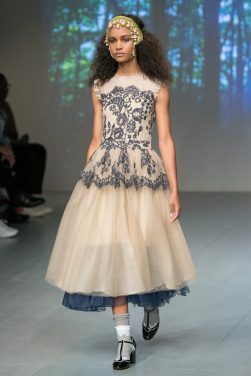 The collection featured a mix of vibrant floral prints and soft silk tulles and laces in a combination of soft feminine fabrics and structured shapes which added a sense of romance to the strong bold silhouettes. Much of the detailing is inspired by early 20th century Romani gypsy lifestyle and their symbolic dress code. Embroidered cut out lace patterns, in whites and dark shades as seen on the dress’s collars, cuffs and ribbons, send a soft-spoken nomadic message. The layering is key for SS19, and Aksu designed very specific and technical embroideries, prints and textures in romantic lines and shapes while maintaining a softness, mimicking the perfect balance achieved in Papuzsa's character. The capes in tulle and organza are also a dominant part of the collection and create an ethereal feel. Dominant colours such as lilacs, purples, corals and hot pinks, are used together with quieter shades such as whites, creams, soft blues, pinks and blacks.